Richard Cohen struggles with failing limbs and is legally blind. He has survived two bouts of colon cancer and a life-threatening blood clot in his lungs. After enduring decades of harsh treatments and invasive therapies, Cohen decided to trade in his life as a patient. In 2012, Cohen and his wife, Meredith Vieira, were invited to host and chair an adult stem cell conference at the Vatican. Scientists would be gathering in Rome to discuss stem cell therapy for autoimmune diseases, including MS. A believer in the power of denial and determination over faith and hope, Cohen was caught off guard by what he learned. Medical technology had advanced further and more quickly than Cohen had known. Could there be a chance his health could improve? Could MS be cured? As Cohen took part in a pioneering stem cell protocol, he opened himself to the possibility of hope for the first time in his adult life. 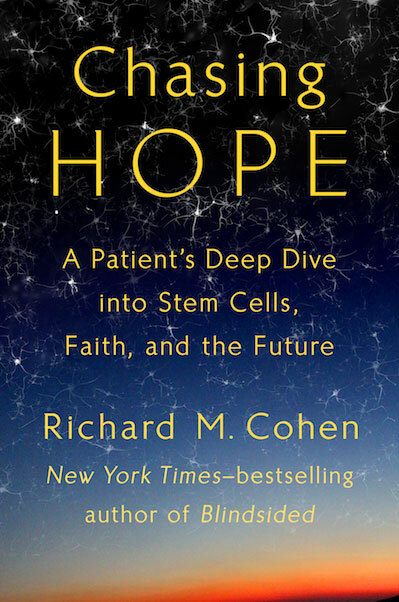 Cohen’s deep dive into the cutting-edge world of stem cell research and his journalistic investigation of hope includes interviews with doctors, scientists, and religious leaders, as well as conversations with others living with chronic conditions, all with the goal of understanding a hope that is both elusive and alluring. As drily funny as it is emotionally vulnerable, Chasing Hope navigates the fascinating and ever-changing intersection between illness and hope.